Thelma’s dipped chicken. photo courtesy of author. It was sometime in the spring of 1993 that I had chicken so good it ruined me for the next 20 years. I was 15, shut up in a blind factory in Lexington, NC. About half a dozen other teenagers and I were toiling away on a project for Odyssey of the Mind, a creative problem solving competition for kids. I was hungry as hell. I was always hungry, but it was 11 o’clock at night and my group had been welding the frame for a homemade go-kart since early afternoon. We’d wisely forgotten to bring snacks, so our grumbling was not without merit. My teammate Andrew, the upper-middle-class kid who was hosting our work in his dad’s factory, offered us a way out. “Let’s go to Clyde’s,” he suggested. Clyde’s? By the time my question had navigated my hunger pangs, we were already in the car and headed down Cotton Grove Road, pulling up next to a shack across the street from South Lexington Elementary and the sliver of the projects which abutted it. The word “shack” is not an exaggeration. There was no sign proclaiming that, yes, this cinder block building, covered in peeling, cheap white paint, was named Clyde’s. No sign in the window letting us know they were open, no people outside, no other cars. Just a wan light from the barred window and the faint sound of voices from inside. It was honestly a little creepy. I would’ve balked right there, but the stirrings of testosterone-fueled pride brought on by a peer next to me kept me there. Truthfully, shamefully, it felt as though there was something illicit about the endeavor, not because it was midnight chicken from a dilapidated building, but because it was all of that in the Black part of town. Lexington is a 30% Black town; the racial divide was real. There were places where you just didn’t go if you were a White kid, not because of any adult decrees, but because of the osmosis of racism in the South. (And surely, much more powerfully, there places you didn't go if you were Black.) If Clyde’s skirted the projects, it was still close enough to seem like I shouldn’t have been there. Andrew walked in like it was no big deal. I followed. I was damned if some rich kid was going to be more comfortable there than I was, even if he was the one introducing me to the place. One room, maybe two tables, a counter in the back. A jukebox with a smattering of contemporary R&B, but mostly a sea of old Motown. The couple of people there didn’t really pay us any attention. A woman at the counter gave us a glance and offered us either an upper or a lower, dipped or not. After a moment’s confusion, I realized it was white or dark meat, with sauce or without. I went with an upper, dipped, and we took our foil wrapped meals—shoved in plastic bread bags—into the car and back to the factory. Now, in the life of every person who loves food—and I mean really, truly loves food—there’s an unforgettable meal, one which lingers for a lifetime and flips a switch to let it be known, at the time of eating, that there’s a world of culture and enjoyment out there the existence of which was formerly only speculated. That meal may come on a dock in Malaysia or right out of your parents’ kitchen. But it happens, and once it does you’re never the same. It was nothing to look at: a quarter chicken, fried lightly, covered in some sort of brownish-red sauce, and (inexplicably) stuck between two cheap hamburger buns. But the taste was electric. The chicken was fried perfectly; I’d had perfect fried chicken before, so good as it was, that wasn’t the pull. But the sauce—the dip—was unreal. It was Western NC barbecue sauce—tangy but with a hint of sweet—but there was other stuff in there, things I couldn’t quite pick out. A lot of butter, to help the dip cling to the chicken. Some clove, maybe some Texas Pete. Whatever it was, I was hooked. It was so good I felt like crying. I didn’t, of course, not in a room of a dozen other teenagers. I kept getting Clyde’s chicken, and I slowly picked up on the fact that he was a legend. He stuck around in the back room, cooking chicken all night, while his wife tended the register. The place was only open at night, and not even consistently, because he didn’t have a license. You’d go in and see cops getting chicken, though, because it was so good that nobody cared. Clyde’s became a nexus of local food folklore, a church of soul food ministering to anyone in Lexington savvy enough to figure out it was there, no matter your race, creed, or class. Chicken as art. And then one day, he and the shack were gone. Clyde died after I’d grown up and moved away. He took his recipes with him; I can still prod friends on Facebook about the chicken and some will say they’ve tried to figure out, that they even know Clyde’s relatives, and nobody knows what it was. And oh, I hunted for this chicken after I left. This is what I’ve been able to figure out in the years since: Dipped chicken is a distinctly Central NC phenomenon; by Central, I mean Central, occupying a strip from the Triad down to just north of Charlotte along I-85, with detours in Statesville and Mocksville. Reliant as it is on the primacy of Western style dip, and vulnerable to the slow march of Eastern style’s triumph in the barbecue wars, there’s no way the chicken can spill its borders much. It’s fried, but not that Frankenstein crispy shell you might be thinking of. This is a soft fry, made softer after the chicken is dipped. Calling it soggy would be incorrect; pleasantly pliable might be better, as the absorbent coating soaks up the dip and holds it tight, with the butter in the dip creating enough viscosity to seal the deal. The pieces are quarters, or halves, rarely individual pieces, cut somewhat haphazardly. Clyde’s was our place, but there were others. A little further south, in Salisbury’s, there was Frankie’s Chicken Shack, arguably the most famous of the dipped chicken places; it closed in 2004. The restaurants dotted the area, but Clyde’s and Frankie’s were the ones Lexingtonians went to. I’m sure the others have their own legends, still whispered about with reverence by people of a certain age in all those old mill towns dotting the Piedmont. New ones have mercifully popped up, all slight variations on the theme—because, really, this chicken alchemy is all about variations, the little extra stuff that a given cook drops into the batter or dip. There’s no recipe in a book to point to, just oral knowledge shared between friends and families who already know. There’s a small chain called Ted’s Famous Chicken in Winston-Salem and Thelma’s in Salisbury, the latter an heir to Frankie’s, owned and operated by a former employee. On a trip down to Lexington several months ago, my in-laws urged us to accompany them to Thelma’s for dinner. For the chicken, my father-in-law told me, a smile on his lips. 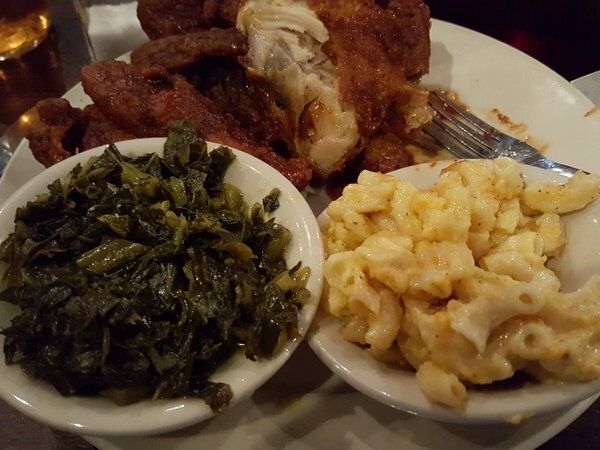 We did and I got the same thing I’d gotten at Clyde’s 23 years earlier: an upper, dipped, this time with mac and cheese and collards, what with Thelma’s being a proper establishment. I bit in and I was there, in that warehouse, eating Clyde’s. I was skateboarding behind the Wal-Mart, a box of chicken on my lap during a break. I was at any number of places at once except in a booth at Thelma’s, eating this soul food oddity, blinking back tears. My in-laws had known Thelma from years prior; they knew what was up with her restaurant, that 20 minutes from their house was a time warp to another culinary time. It was perfect; I told Thelma as much when she came to the table, though I’m not sure she could pick me out of a lineup. If you’re on I-85 and near one of these special places, you could do worse than stop in for a bite. It would be appropriate to say that this style of chicken vanishing if it was ever widespread in the first place. As it is, it’s better to simply call it “special”, because it is, a meal sitting at the physical and cultural crossroads of that thin sliver of North Carolina sandwiched between mountains and the slow descent to the sea. Thelma’s going to start bottling her sauce, by the way.